To prepare the players for the Olympic glory @ Tokyo 2020 & Paris 2024 Olympic Games, Tata Motors Commercial Vehicle Business will help nurture an international standard eco system for athlete support to help India create a new success story at the greatest global platforms. 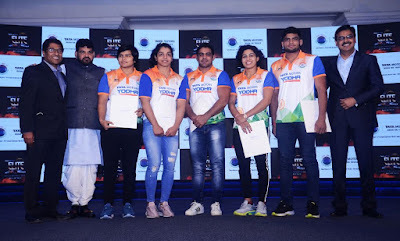 The program will appoint top class foreign coaches for both men and women squads ,best possible support staff who will work both on the physical & mental development of the athletes and organize premium exposure trips for the elite Indian wrestlers so that they train and hone themselves according to the global training standards. The support staff will include experienced physiotherapists, biomechanics, mental trainers and nutritionists. In addition, Tata Motors will also provide insurance cover to the Indian Wrestlers. Speaking on the occasion, Girish Wagh, President, CVBU, Tata Motors, said, “Tata Motors, in line with its Group’s heritage has constantly looked at encouraging sports and promoting sporting talent across India and overseas. Wrestling as a homegrown sport has definitely grown in popularity and needs further support in enhancing talent. We are strengthening our association with WFI by directing our efforts to promote, train and develop wrestling talent with advance coaching and international sporting experience. We hope these initiatives help the Indian team to perform better. Our best wishes to the team for the forthcoming Tokyo 2020 & Paris 2024 Olympic games." Commenting on the partnership, Brijbhushan Sharan Singh, President – Wrestling Federation of India said, " Tata Motors coming on board as Indian Wrestling’s development partner will go a long way in creating a strong sporting ecosystem and strengthening our elite program. These facilities will help wrestlers focus fully on themselves and prepare for the toughest tests before winning medals for the country. WFI is grateful for the trust shown in the Federation by Tata Motors and strongly believes that this binding and cooperation will eventually help make a strong beginning for wrestling in India ". The event will also observe handing over of central contract to the wrestlers. For the first time in the history of Indian Sports, Tata Motors, along with WFI has announced central contracts to a sport other than Cricket, assuring guaranteed benefits to Indian Wrestlers. The central contracts are annual retainers that will be spread across 150 players as per grades and assure basic annual earnings for the players, through the sport. Today, sports with the energy and dynamism is a major platform to connect with people across India – both masses as well as classes. Wrestling is a homegrown sport that reflects machismo, aggression and endurance that tests speed, agility and power, and are gaining popularity in India and overseas. These attributes blend perfectly with the rich heritage, longevity, durability and robust performance of our Commercial Vehicles. This association will provide Tata Motors the platform to reach out to various stakeholders and the public at large.